Unlike deciduous trees, evergreens provide color year-round. Examining an evergreen's leaves (or needles) is key to identification of a particular species. Evergreens' foliage can fall into these categories: needles, scales and awl-shaped. Once you know what leaf category the evergreen falls in, you can narrow down the characteristics until you identify the plant. Common evergreens include firs, junipers, hemlock, Douglas fir, Siberian cypress, spruce, yews and pine. Examine the leaves for needles. Typically, a series of needles is attached, one by one, to a twig. They range in length depending on the species. The Eastern hemlock, for example, has flat needles that are 8 to 15 mm long. Other conifers have needles in clusters of two to five that start growing from the same point, then separate into individual needles. The Red Pine falls into this category. It has two needles per cluster, measuring 7 to 17 mm. Meanwhile, Larch trees have needles that grow in clumps. They measure 1 to 3 cm long. Look for foliage that grows from center stems. If it narrows and tapers to a sharp point, it's an awl-shaped leaf. Platycladus orientalis (arbor vitae), Juniperus silicicola (red cedar) and Taxodium ascendens (pond cypress) are examples. The red cedar's leaves measure 1/5 inch to 1/4 inch long and 1/16 inch wide, and end in a spiny point. Examine the ends of the foliage. If the tree has foliage sprays that are mildly flattened and there are no needles, the evergreen has scale-like leaves. The foliage grows from one central stem, then branches out in several directions in a non-uniform pattern. Each piece of foliage is a different length. Touch the leaves. Feeling awl-like foliage will help you identify it. Each one feels a little different. For example, junipers are sharp to the touch, red cedar is prickly and Siberian cypress are soft and flexible. Study the appearance of needles. If the needles are square, it's a spruce. If they grow in groups of two, three or five, the evergreen is a pine. 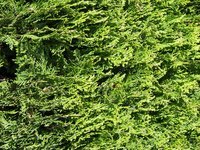 If they are 3/4 inch to 1 inch in length, flat and all-green in color, the evergreen is a yew. If two white bands are under the needles, and they are much shorter and connected to a small stem, it's a hemlock. If the short, banded needles don't have a center stem, the evergreen is a fir. Concolor and Douglas have needles that resemble the hemlock, but Douglas' needles are 1½ inches long and concolor fir needles are 3 inches long. Examine scale-like leaves to determine their species. False cypress species' foliage isn't flat and is slightly larger than arborvitae foliage. Both have tiny leaves (1/16 inch to 1/8 inch long) that are flat and fanned-out. Look for pine cones. These can range from 2 to 3 cm, which is the case with black spruce, to huge cones on the Norway spruce that measure up to 15 cm long. Some evergreens have more than one leaf type. How Long Does It Take a Christmas Tree to Mature?